"In Matt Schumacher's The Fire Diaries, '[t]he wheels attempt to grip the violet highway' as a car passes through a forest fire. Schumacher's poems pivot on a central theme: a poet in utter control of his medium, writing about uncontrolled burning. Schumacher shape-shifts fearlessly, speaking sometimes through the voices of witnesses, and sometimes through the fire itself, as poem after poem spontaneously combusts. This is a terrific book: funny, scary, and visceral." 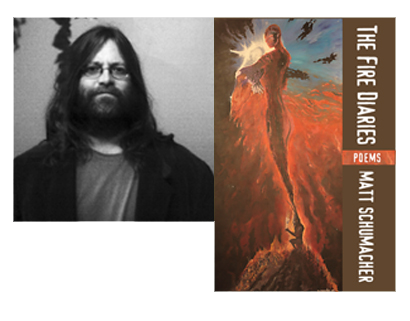 "To read a Matt Schumacher poem is to enter a world of riotous word riffs and fire-related incantations. Meditative, hauntingly chaotic, and beautiful, these poems will singe your memory. This ample collection glows with great personal and historical revelatory spark." "In The Fire Diaries, Matt Schumacher draws on accounts ranging from the great Chicago fire to the Buddhist monk Thich Quang Duc's self immolation and ignites them with the 'mind's embroidery' to take his readers on an unexpected and transformative journey...Through the intermediary of his rich lyrics, Schumacher...calls his readers to see beyond the ordinary..."
​Educated at the University of Maine and the Iowa Writer's Workshop, Matt Schumacher is a vagabond transplant who considers himself an Oregonian. His first collection of poetry, Spilling the Moon, made its debut with Wordcraft of Oregon in March 2008, and his poems have recently appeared in ZYZZYVA, Green Mountains Review, Sub-Lit, basalt, and Portland Reivew. A short version of this collection, Fire Diary, was chosen by Matthea Harvey as the winner of the Well Lit Press chapbook contest in spring 2008. He lives with his wife, Kaley, and is pursuing a doctorate in English/Creative Writing at the University of Wisconsin-Milwaukee.